Native Instruments has released the latest version of the world's most popular pro DJ app – TRAKTOR DJ 1.4 for iPad and iPhone. Along with new effects and usability improvements, this free update introduces seamless Mixcloud integration in TRAKTOR DJ and a new partnership with the sharing platform designed for DJs, radio presenters, and Podcasters. To celebrate this collaboration, Native Instruments is holding a special DJ mix competition to win a trip to Ibiza. After winning the App Store's 2013 editor's "App of the Year", TRAKTOR DJ 1.4 now offers in-app integration with Mixcloud. A valuable new feature, DJs can record their mix, then upload it to their Mixcloud profile directly from within the app. This allows the great benefit of sharing TRAKTOR DJ sets freely online in an instant without having to export and manually upload the file. Three new unlockable effects have also been added to TRAKTOR DJ's creative features. Iceverb, Transpose Stretch, and Reverse Grain can be accessed for free when a notification window prompts the user to unlock. Playlist and subfolder editing have been improved for better in-app track management in addition to a variety of smaller stability and usability improvements. The new partnership with Mixcloud brings together TRAKTOR DJ for iPad and iPhone with the largest community of DJs on the web. In celebration, Native Instruments offers DJs the chance to share their sound for a paid weekend getaway in Ibiza. Until May 31, 2014, mixes recorded and uploaded to Mixcloud using TRAKTOR DJ will be automatically be entered in the contest. Acid house legend A Guy Called Gerald will guest-judge the mixes and select the lucky winner. 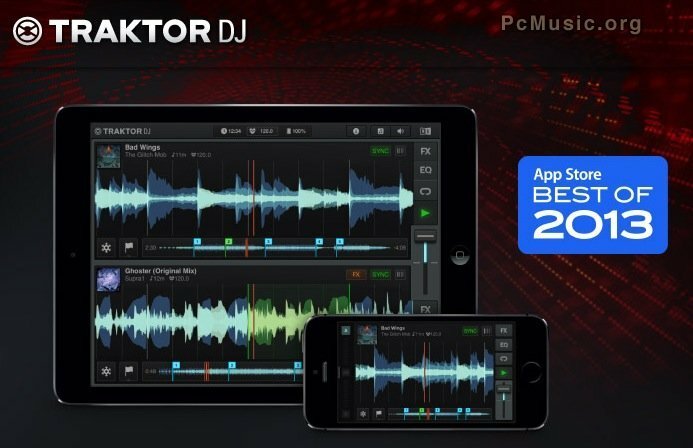 TRAKTOR DJ 1.4 is now available for download in the App Store for $9.99 / 8,99 € / £6.99 / ¥1,000 for iPad and $1.99 / 1,79 € / £ 1.49 / ¥200 for iPhone. Current users can update their version for free.